Welcome back to Ultra Budget Brews, the article series that has an unhealthy amount of excitement about March Madness, brackets, and everything college basketball related this time of year. 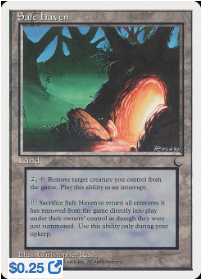 It is also the article series that builds entire EDH decks in which no card costs more than $1. 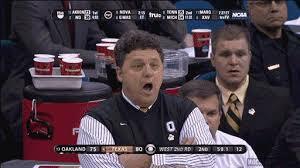 So…all the cards are mid-majors? Cinderellas? Yep. Pretty sure how that’s how this works. 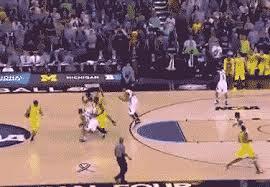 While part of me wants to make you all sit through an entirely March Madness-themed article (I almost did this, but I’m not a monster and realize most of you probably don’t give a wet fart about sportsball), I decided that all of my normal gifs will be March Madness themed instead, because a good compromise is when both parties are dissatisfied. Yasova came out on top with almost 1/3 of the vote. Chisei performed admirably as well and as a result, will likely reappear on a poll sometime in the future. As for Zedruu, Selvala, and Kangee, it’ll probably be a bit before they reappear as they’ve all made multiple appearances. 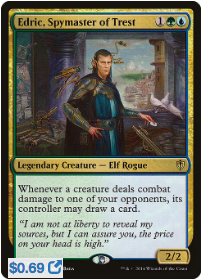 Granted, there are only so many commanders that cost under $1, so they’ll probably make it back in at some point. Temur colors offer a little bit of everything. Easy to cast (2/3 of color identity comes from her ability). Ability is a bit mana intensive. Ability only steals creatures with power less than hers, instead of less than or equal to. 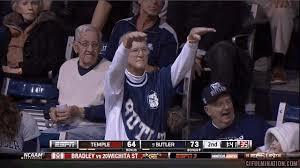 Timing of the trigger can lead to confusion. As I was doing some background research for this article, I found a previous article that Mason Brantley wrote here at EDHREC a few months ago. He did a great job explaining some of the rules connected to Yasova’s ability. Instead of going in-depth, I’m going to paraphrase a bit. Yasova doesn’t have to attack to take advantage of her triggered ability. Mana is paid for once the ability resolves, meaning we don’t lose mana if a opponent sacrifices the targeted creature in response. If we have a way to flicker (i.e. Ghostly Flicker) the creature we have stolen, we gain permanent control of it. You can’t activate Yasova more than once per combat (http://magicjudge.tumblr.com/post/109270019834/can-i-activate-yasova-dragonclaws-ability). 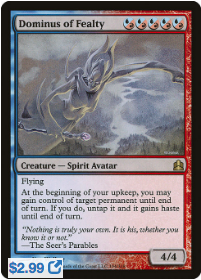 Cards like Xenagos, God of Revels don’t work with Yasova because of how they are timed. 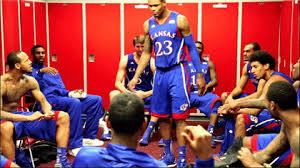 Something to note is that you have to give your opponents a chance to respond to you moving to your attack step. Often, this won’t be that important, but there will be times that it matters. I only bring this up because often times people can sprint through their main phase and skip right to their attack phase. If you don’t give people a chance to respond, and you rush to your attack phase and start attempting to steal creatures, you have effectively given away what your strategy was and people are going to want to go back and have an opportunity to respond before you enter your attack phase. This might seem very rules lawyer-y, but going through those motions is something that will make you a more technically proficient player, which is never a bad thing. 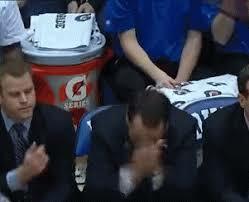 With that out of the way, on to the deck. 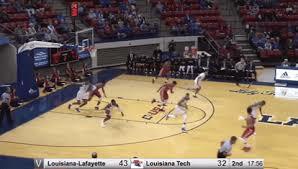 Drive the Lane or Double Dribble? I enjoy brewing decks, especially those that are a bit off the beaten path. That being said, I never want to make something different just for the sake of being different. If it doesn’t make sense or won’t work, building it is kind of silly. Yasova gives us a very clear direction; stealing creatures. That’s it. There’s not a lot else going on there, but since that was the ‘normal’ build, I wanted to try and build something else. The first path I looked down was tribal warriors. This would have been fine, I guess, but a lot of the good warriors are outside of our price range and the deck would have ended up being a hot mess. Hard pass. The other thought I had was tribal clones with Leyline of Singularity. The deck would clone enemy creatures, steal those creatures and kill them off with the legend rule. Frankly, this sounded like a ton of fun, but I ran in to two problems. First, most of the good clones are really expensive. Clever Impersonator, Stunt Double, Phyrexian Metamorph and friends are all more than $1 and for good reason. Secondly, having an entire game plan revolve around naturally drawing a single, easily destroyed enchantment out of a 100 card deck with no real tutors sounds like a great way to lose a ton of games in truly miserable fashion. Cards that do bad things to the creatures we steal. Sounds like just the sort of party I want to invite my opponents to. The first of these categories is ramp. If you are in green, you should probably be running Farseek, Rampant Growth, and Cultivate. 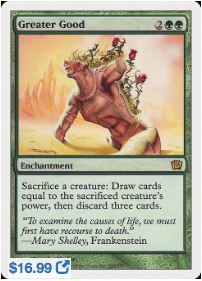 These are some of the cards that make green so powerful in EDH. You color fix, get mana faster than your opponents and improve your future draws (granted, by an admittedly negligible amount.) These cards are the very definition of staples and if you don’t have copies of these cards and enjoy playing green, go get some. Getting them yesterday would have been preferable, but now works too. We also have to run some card advantage, like card draw and removal. 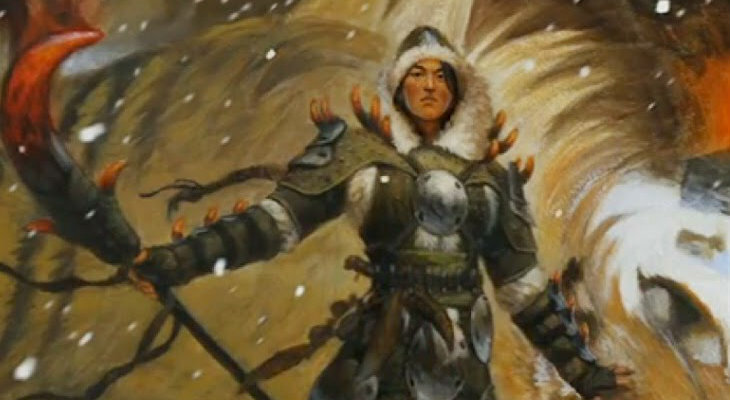 Hull Breach, Harmonize, Treasure Cruise are cards that any Temur deck would be happy to run. We also have a number of counterspells to make sure our opponents don’t get up to anything too tricky. There are a few cards that boost Yasova’s power to allow her to steal bigger things. Without that, we would only be able to steal creatures that are 3 power or less. There are certainly cards worth stealing that qualify with that, but we would like to be able to steal bigger things as well, giving us more options. We might not ever be able to steal giant spaghetti monsters, but titans and dragons should be within our reach eventually. Cards like Hero’s Blade, Lovisa Coldeyes and Obsidian Battle-Axe are some of my favorites to help with this. We can’t count on having Yasova all of the time, and even when we do have her, the other creatures might be big that it’s unlikely she’ll be able to steal them with her ability. As a result, we have included a number of cards that steal creatures, no questions asked. Besmirch, Mob Rule, Mass Mutiny, and Word of Seizing are great at this. 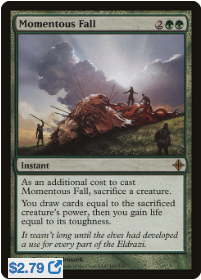 Captivating Crew does this repeatedly and Zealous Conscripts even allows you to steal noncreature cards. 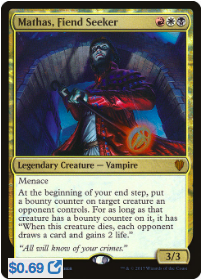 Probably the biggest category of cards are the cards that allow us to do bad things to the creatures we steal. This normally involves our opponents not getting their creatures back. We have a number of ways of exiling, sacrificing, and even bouncing their creatures back to hand. Using their cards against them and then getting rid of them is exactly the kind of fair Magic that I want to be playing. 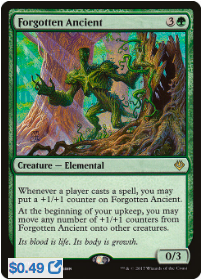 We often even get additional value, whether in +1/+1 counters, damage, creatures, or card draw. Cards like Ooze Garden, Synod Sanctum, Heart-Piercer Manticore, Evolutionary Leap, and Spawning Pit are some of the highlights. 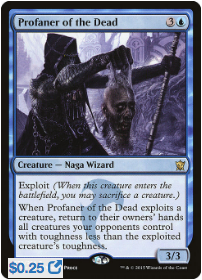 Of all the ways to sacrifice our opponents creatures, this just may be my favorite. Using them as ammunition to destroy their non-basics is hilarious. If your playgroup is anything like mine, there are likely a number of powerful lands being laid down. While many groups don’t like mass land destruction, playing targeted land destruction is a necessity. Cards like Reliquary Tower, Valakut, the Molten Pinnacle, Cabal Coffers, Maze of Ith, Glacial Chasm, or any of the new flip lands are all cards that can take over a game and that requires an answer. Shivan Harvest is a great one. I run a Magic Club at the High School I interpret at. As you can imagine, I’ve gotten many of the students into EDH as its one of the best formats for that sort of thing. As in any group, there is a variety of skill levels present, with some students having only played Magic for a handful of months and others playing since they were old enough to read. One of the players that has been around for awhile plays this card. All. Of. The. Time. Every one else ignores it, cause “It’s only a 0/3”, allowing this card to stomp everyone. After watching this happen a number of times, I finally gave this ‘pro tip’: Kill this baby on sight, or you are likely in for a real bad time. 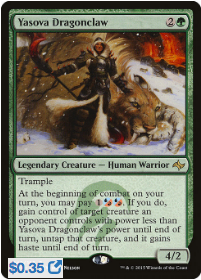 It grows like crazy, and in this deck, makes Yasova lots bigger, enabling her to steal bigger things. 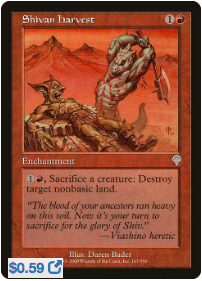 This card, and it’s spiritual successor Endless Sands, give you a way to use your lands to exile your opponents’ stolen creatures. I chose to feature this one because it was released forever ago and people are much less likely to know about it. Having the ability to exile attached to a land is great. In a pinch, you can use this to save an important creature from removal and bring it back later. 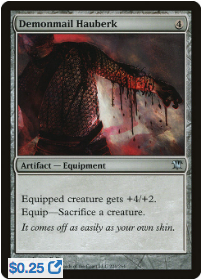 Do note that this doesn’t tap for mana, unless your opponents are playing Urborg, Tomb of Yawgmoth or something. This card does a number of things very well. It grows Yasova, enabling her to steal larger things while also being a free sacrifice outlet. 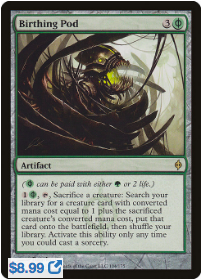 It’s a bit like a more expensive Grafted Wargear (which is a card we would totally have here if it was in our budget). This also turns Yasova into a 3 turn clock with commander damage which is something that will come up a non-zero amount of the time. First off, that art. 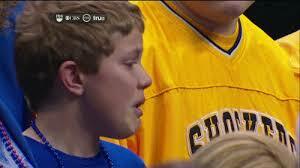 It reminds me of that kid from the family that takes trick or treating waaaaaaaay too seriously. Yes, I’d love to put some candy in the mouth of your…decapitated head. Tis the season! 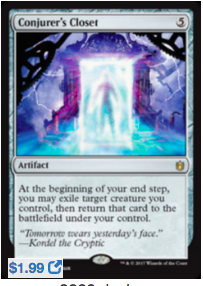 Using this to exploit an enemy creature to pull off a creatures-only overloaded Cyclonic Rift is great value, but it’s a bit expensive at 7 mana. In a pinch, you can sacrifice one of your own creatures, hopefully allowing you to alpha strike someone. It can also sacrifice itself to the exploit trigger. 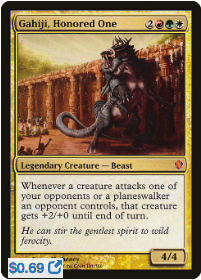 This card seems underplayed and I’ve never had it played against me. When cards are underplayed and unexpected, they can take an opponent completely by surprise. These are the cards that were excluded from the decklist because of my self imposed budget. I would play them if I were looking to upgrade the power level of the deck, uninterested in the budget restriction, or if I just had extra copies laying around. This card works because how it’s worded. Instead of returning it to its owner’s control, it’s returned under your control. Permanently. It also works well with cards like Coiling Oracle, Acidic Slime, and Wood Elves, allowing you to get another use out of their enters the battlefield ability. This card provides lots of value. There is a good reason this card is in close to 10,000 decks. This is probably the first card I would add to the deck. It’s just that good. 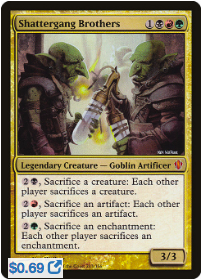 Not only are you sacrificing an opponent’s creature, you are getting to tutor for one of yours. Also, getting to use life instead of mana if needed is gives you a lot of flexibility. The value on this is strong. So is the price tag, but it’s an incredibly fun card to play with. Definitely worth trying to trade for. 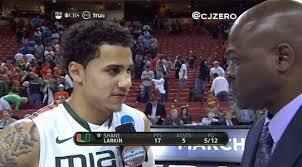 I’ve always looked at this as Life’s Legacy’s, bigger, stronger, much more successful brother. The life gain matters some percentage of the time, but you are mostly here for the card draw and because it’s instant speed. I used to play this card quite a bit and is one of the first cards I thought to add in here. Hadn’t realized it had creeped up to almost $3. If you can get your hands on a copy, it’s a great card. I normally try to stay away from cards that cost more than $10 in this section, but sometimes, exceptions must be made. This card is incredible. It’s an enchantment that gives you a free instant speed sacrifice outlet that also draws you cards. Obviously, it’s best when you are using it on your opponent’s stolen creatures, but you can even use this on your own creatures in response to removal, or to try and find the card you need to bail you out of a bad situation. That’s all I have for this week. What did you think? Does this look like the kind of deck you’d enjoy playing? Was there anything super obvious that I missed? Let me know below! 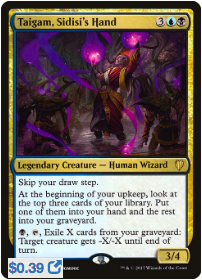 As for next weeks poll, we’re going to look at some forgotten commanders from Commander products. As always, vote for which you’d like to see below. Until next time!